Here at Nothing-In-The-House we get very excited about ideas and examples of food (particularly pies, of course) and community and food as an agent for social change, especially through a re-purposing of domesticity. 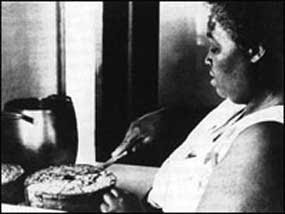 Georgia Gilmore was a Civil Rights hero who put these ideas into practice, starting "The Club From Nowhere," a group of women who baked pies and cakes to raise money for the 1955-1956 Montgomery Bus Boycott. Mrs. Gilmore also opened her Montgomery, Alabama home kitchen as a meeting place for activists like Dr. Martin Luther King, Jr., providing them not only with a safe space to convene, but nourishing them with delicious home-cooked meals. Check out this story about her and the Club from Nowhere, done by the amazing Kitchen Sisters in their Hidden Kitchens series. GO GEORGIA! I really enjoyed reading about the Club from Nowhere. It's a pleasure how a search for one item can lead to discovering completely unrelated yet fascinating stories such as this one! I have something pie-related you may enjoy hearing about for your blog. Please contact me at emcozic@yahoo.com.